Durong Dingo Sanctuary’s Simon Stretton is full of praise for the firefighters who brought a wild grassfire under control on Sunday, just metres away from his animal enclosures. “Dingo” Simon – as he is fondly known – has only recently been discharged after spending 10 weeks at Kingaroy, Murgon and Toowoomba hospitals. While he was away, a friend looked after the sanctuary, doing whipper-snipping, mowing and slashing which meant the property was well-prepared when a fire broke out a few doors away on Sunday. Simon told southburnett.com.au he first became aware of the fire when he saw smoke rising through the trees and going up into the sky. “But I couldn’t see any flames,” he said. “Then I went outside and heard the crackling of a fire coming from a neighbour’s property. “I rang my neighbour Lachy who lives two kilometres away up on higher ground. Annette said he was out there with his fire-fighting unit trying to battle the flames. The fire brigade had already been called. Simon said he drove his tractor to his neighbour’s property and then down the driveway where he could see a red urban brigade fire truck through the smoke. 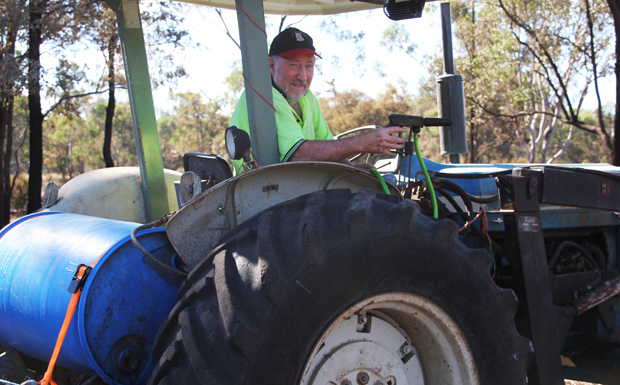 The flames in front of him were less than a metre high so he dropped the bucket of his tractor on to the edge of the fire and pushed along it to try to smother the flames. “This can be tricky, especially with some grass fires that emit a certain smoke that can blind and suffocate you, so I make sure I go as fast as I can then pull away to catch my breath and start again,” he said. He said the fire truck began to follow him, putting out flames he had missed. 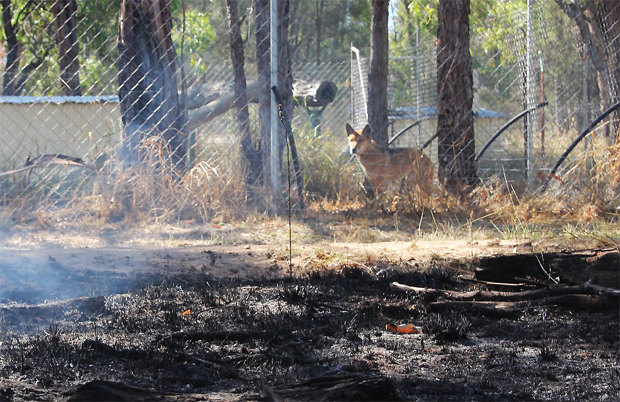 Simon said he then looked up and saw the fire front had moved northwards and was heading towards his dingo enclosures. “I madly turned around, drove back over the creek and up to the back of the enclosures,” he said. “Fortunately I had just slashed a five metre fire break on Thursday. “The grass fire jumped and began burning into a new enclosure I have been building. 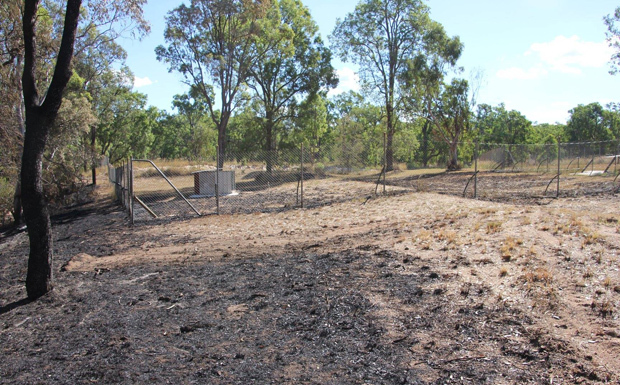 “Fortunately there were no dingos there and the grass was very low so the fire was moving slowly. “I drove back to the house and grabbed my knapsack, filled it up with water and walked back to the new enclosure. “I got on top of the fire with my knapsack but I was stuffed. “An urban truck then drove through the fence, along the back of the enclosures, down over the creek and set up near a dam to stop the fire spreading any further. Simon said he believes the fire began on a property on McPhee Road and then burned in a north-westerly direction towards McLean Road. He admits that when he finally got back to his home, he simply collapsed. “You don’t have time to think if what you’re doing is safe or if it is dangerous. You just have to do stuff,” he said. “I thought at one stage that three of the female dingos had escaped to get away from the fire and the noise, maybe climbed over a barrier or electrocuted themselves on a fence,” Simon said. One of the male dingos panicked and did get out of his pen but was stopped from escaping by a second fence around the enclosure area. Simon said it would have been a lot worse if he had not been working for years to keep the grass down around the enclosures. “We all survived. No one escaped and no one got hurt,” he said. However, he said one neighbour had lost about 50 per cent of his pasture and would probably have to buy in feed for his cattle during winter. More than a dozen fire trucks – urban and rural – attended the blaze and successfully protected at least six houses. “I am very grateful for everything they did,” Simon said.